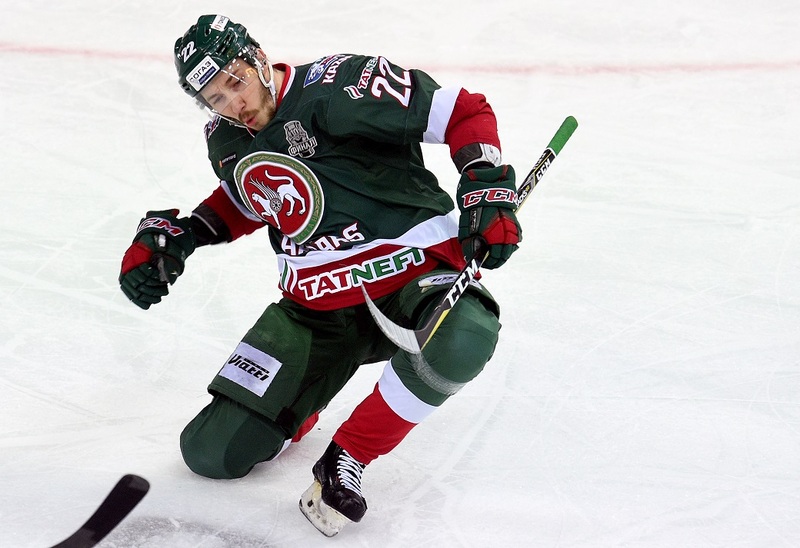 Stanislav Galiyev struck twice to give Ak Bars victory in the opening game of the Gagarin Cup final – and reawaken a rivalry from his youth hockey days. Galiyev, now 26, learned the game at CSKA’s cross-town rival Dynamo, rising through the age groups to represent the club in the Russian U16 Championship finals in 2007. After that he headed across the Atlantic, impressing in the junior leagues but unable to force his way into the Capitals’ offense, before returning to Russia in the summer to join Ak Bars. His first season back in his homeland was solid enough but rarely saw Galiyev making big headlines – until today, when it really mattered. Then, at the start of the biggest series of the season, he produced a game winning performance with two sniper’s finishes to see off CSKA and give Ak Bars the early initiative as the Kazan team goes for a record-breaking third Gagarin Cup win. Galiyev opened the scoring in the ninth minute as Ak Bars picked up the pace following a sluggish start. Nikita Lyamkin kept the puck in the CSKA zone and fed Vladimir Tkachyov on the right wing. Tkachyov slipped the puck to Galiyev, who unleashed a shot from the top of the circle to beat the Swedish goalie. SKA had failed to score on Lars Johansson in 74 attempts in the previous round; Ak Bars needed just five efforts to beat him today. Then came the winner midway through the final frame, with Galiyev clinically completing a breakaway. CSKA’s Andrei Kuzmenko went close at the other end but his shot was off target and Tkachyov picked up the puck behind his own net. Tkachyov’s long pass found Danis Zaripov loitering with intent at the entrance to CSKA’s zone – the visitor claimed offside, the officials disagreed – and Galiyev joined his veteran team-mate to wrap up the play with the visiting defense hopelessly out of position. Delight for Ak Bars and an important winning start to a series in which CSKA is widely seen as the favorite. The Army Men, however, can point to promising signs of their own. True, the team’s injury problems remain: neither defenseman Mat Robinson nor forward Kirill Kaprizov were ready in time for Saturday’s game. But CSKA showed early promise until its momentum was disrupted by a too many men penalty, and produced an impressive performance in the second period to bring the scores level. The visitor created several presentable chance before Valery Nichushkin found the net in the 34th minute. He fired home from between the hash marks off an Alexander Popov feed, but the Army Men’s break away stemmed from two home players colliding in centre ice and opening up the rink for CSKA. 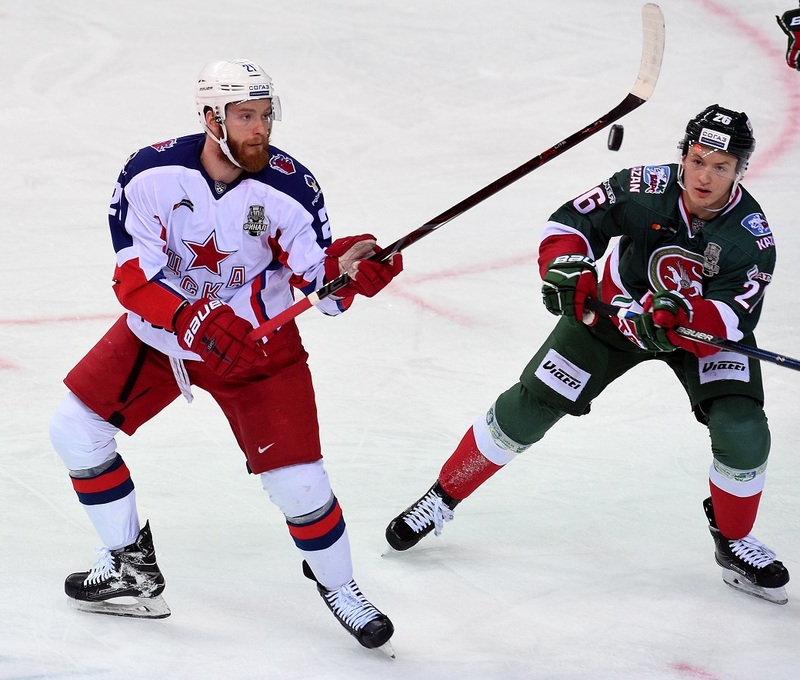 At that stage, it began to feel like the fates my be conspiring against Ak Bars: Tkachyov and Rob Klinkhammer had missed great chances in the first period and CSKA was moving into ominous form. Even the talismanic Justin Azevedo was not riding to the rescue: his 11-game scoring streak came to an end here, with his line well-marshalled throughout the game.